Set your little one up for a lifetime of high fashion with Dolce & Gabbana®. Spread collar with ruffled details at chest. Short cuffed sleeves. Full button front closure. Straight hemline. 97% cotton, 3% elastane. Professional dry clean only. Made in Italy. This item may ship with an attached security tag. Merchandise returned without the original security tag attached or a damaged tag may not qualify for a refund. Measurements: Length: 20 in Product measurements were taken using size 8 (Big Kids). Please note that measurements may vary by size. Set your little one up for a lifetime of high fashion with Dolce & Gabbana®. 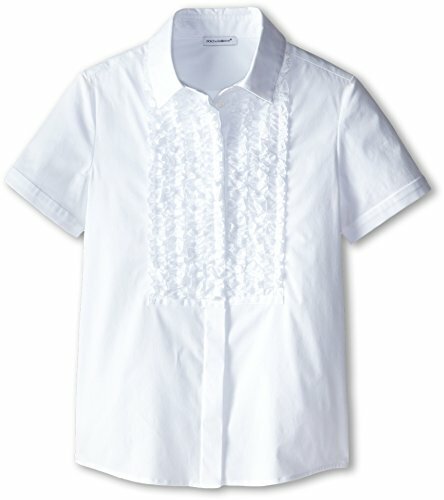 Spread collar with ruffled details at chest. Straight hemline. 97% cotton, 3% elastane. Professional dry clean only. Made in Italy. This item may ship with an attached security tag. Merchandise returned without the original security tag attached or a damaged tag may not qualify for a refund. Measurements: Length: 20 in Product measurements were taken using size 8 (Big Kids). Please note that measurements may vary by size.